Bloomsbury Children's Books, 9781681195070, 32pp. For fans of Press Here, this new interactive picture book line invites readers to touch and move and "play" with the book. Hello, friend! It's time to play! We're taking care of pets today. There are lots of ways little hands can care for animals. 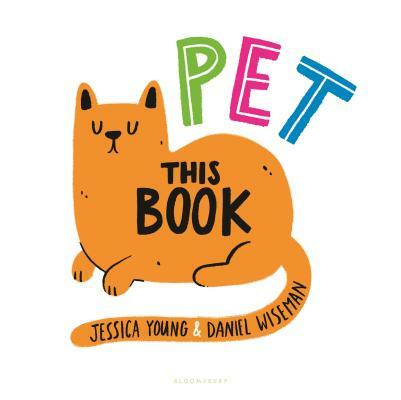 Each page of this book invites readers to pet the cat, wash the puppy, brush the horse's mane, and more--no animals required! With a delightful rhyming text and engaging illustrations, this book is full of pets who can't wait to play. The only thing they need is YOU! Just use your imagination, turn the pages, and Pet This Book! Pair with Play This Book, another title in this young picture book line that comes printed on heavy-duty card stock pages to stand up to all kinds of play! Jessica Young is the author of the picture book My Blue Is Happy, which was a Charlotte Zolotow Highly Commended Title and the recipient of the Marion Vannett Ridgway Award. She is also the author of Spy Guy: The Not-So-Secret Agent; the Finley Flowers chapter book series; and the illustrated chapter book series Haggis and Tank Unleashed. When Jessica isn’t writing and researching her own books, she’s busy doing school visits and listening to music. She grew up in Ontario, Canada and lives in Nashville. Daniel Wiseman likes to draw. He likes it so much, he’s made a career out of it. Usually he draws animals wearing clothes, or kids enjoying a good dance party. However, when prodded, he’s been known to draw pretty much anything else. Daniel currently lives in St. Louis, MO with his beautiful wife and his equally beautiful son. When he isn’t drawing, he can usually be found doing one of these great things: Perfecting his biscuit recipe, hiking up a mountain in some faraway location, singing loudly in his car, riding his bike on the mean streets of St. Louis, or napping. "Eye-catching for young readers. . . . A fun, interactive read-aloud perfect for a ­pet-themed storytime. - School Library Journal"